"Louis Robert Perini (4 of 4), Commencement ca. 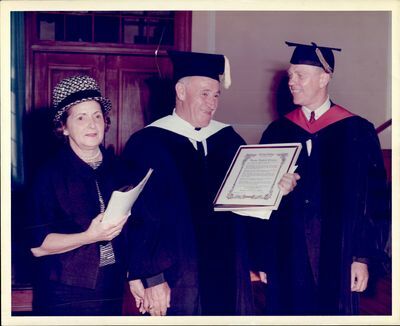 1950s - 60s"
Louis Robert Perini is given an honorary doctorate at the 1963 Fall Convocation. Standing alongside his wife (left) and Lesley President, Dr. Don A. Orton (right). Perini holds a framed certificate addressed to him in his hand. NOTE: A black and white copy of this photograph can be found in the Lesley Review (Winter 1963).